1999 Inkworks Buffy the Vampire Slayer trading cards capture the show hitting its stride. It also sets a high standard compared to the vast majority of Buffy-themed sets released by the card maker. In addition to a comprehensive base set, the release features a nice assortment of inserts and another excellent list of autograph signers. The 1999 Inkworks Buffy the Vampire Slayer Season 3 base set has 90 cards. Besides offering episode summaries as Buffy, Willow and Xander head for high school graduation, there are subsets for both the heroes and the big bads, Willow's spells and more. Leading the insert chase are six autographs. All of the signers have prominent roles in the show. Among them are Eliza Dushku (Faith), Nicholas Brendon (Xander) and James Marsters (Spike). Numbering for the autographs carries on from previous Buffy sets. At this time they weren't a guaranteed box hit and Inkworks never released official odds. 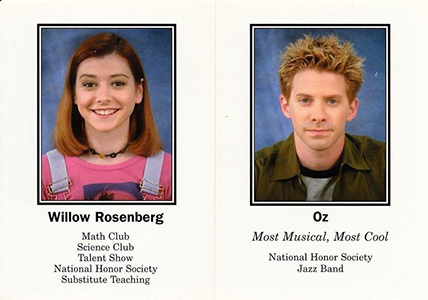 1999 Inkworks Buffy the Vampire Slayer has three other inserts, two of which have a high school grad theme. 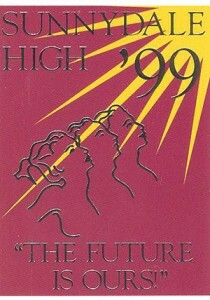 The Future Is Ours is a foldout card that mimics a yearbook. The fronts all have the same yearbook cover design. When you open them up, it's done to look like a small yearbook with senior year mugshots. Graduation Day is the standard foil puzzle that was part of almost every Inkworks set. 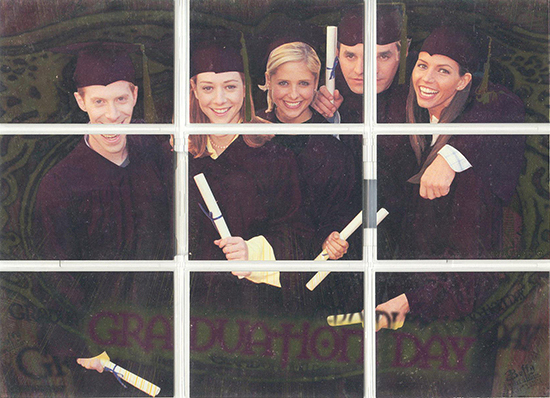 The completed set forms a collage of Buffy and her friends in the cap and gowns. An uncut sheet of the puzzle numbered to 1,999 was sold separately. The final insert is titled Friends Forever. The die-cut card is something of a short print, inserted 1:108 packs. Inkworks also made a custom binder for the release. Buffy the Vampire Slayer Season 3 Yearbook Y4 "Bridge over Troubled Waters"
Buffy the Vampire Slayer Season 3 Yearbook Y5 "School Spirit"
Buffy the Vampire Slayer Season 3 Yearbook Y6 "Farewell"
2 "Pay at the Counter"
88 "It Started with a Girl." 6 cards. Insertion rates not announced. Also available as uncut sheet (#/1999).